We were up before first light, the chirping of unfamiliar birds outside our window. Eagerly we got ready and headed out to explore the gardens again. But wait, where are Bob's binoculars? Ah yes, hanging on the back of his chair at the outdoor restaurant the previous evening. Well, let's just hope that they have been handed in as a week of birding in Costa Rica might otherwise be a little bit tricky. Luckily they have and Bob comes back from reception with a pair of bins, panic over. Shortly after Leonardo - Leo - turns up and shows us all the birds in the garden that we have somehow missed. He is birding by ear and the bird we do not want to miss - Spot-breasted Oriole, here and nowhere else on the itinerary - he picks up quite quickly. I'd gripped Bob off the previous evening with a quick glimpse, so he is doubly pleased to be able see it. And with the added bonus of through his binoculars! 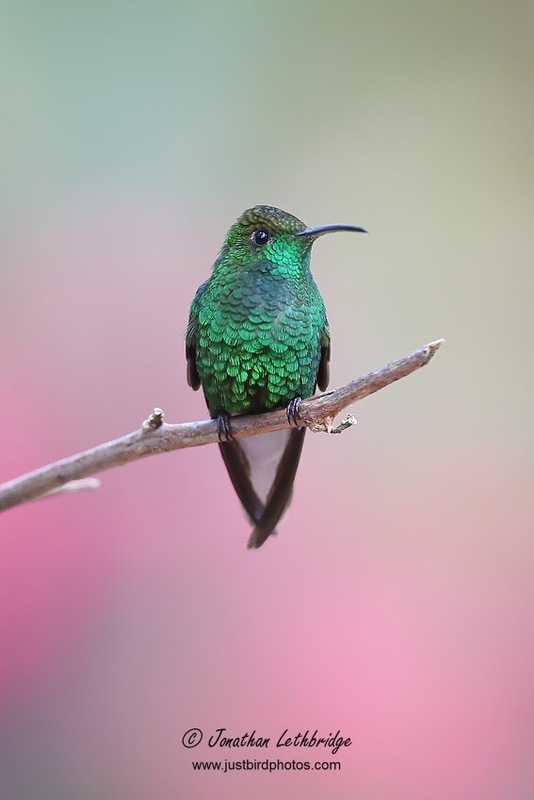 Cinammon Hummingbird is also around the pool feeding on the small purple flowers known as Porterweed, as well as Rufous-naped Wren, a chunky bird that belies the status of Wren! We get to know Leo a little bit over breakfast and then head off north towards Poas volcano on Route 146. Our first stop is a small garden opposite a restaurant (Tour de Fresca Organica Costa Rica) in village called Poasito. 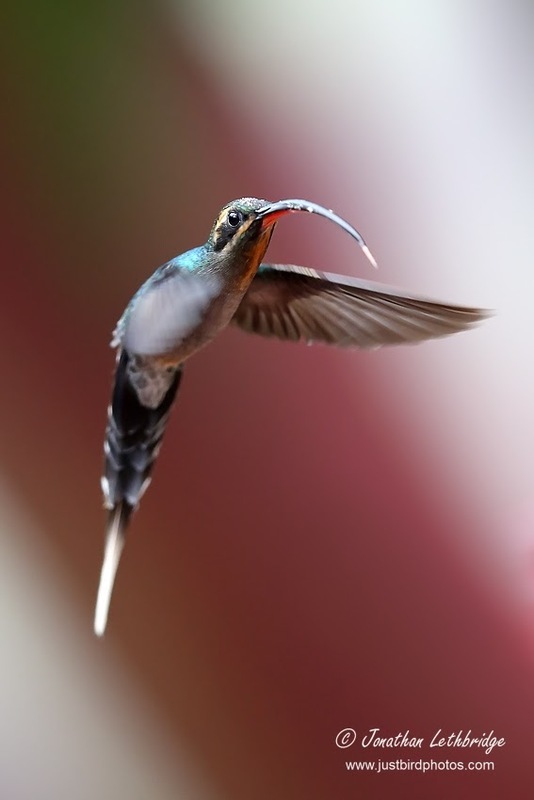 It is a brief stop as we have some way to go but we begin to add to our Hummingbird totals here, including Purple-throated Mountain Gem and various others. 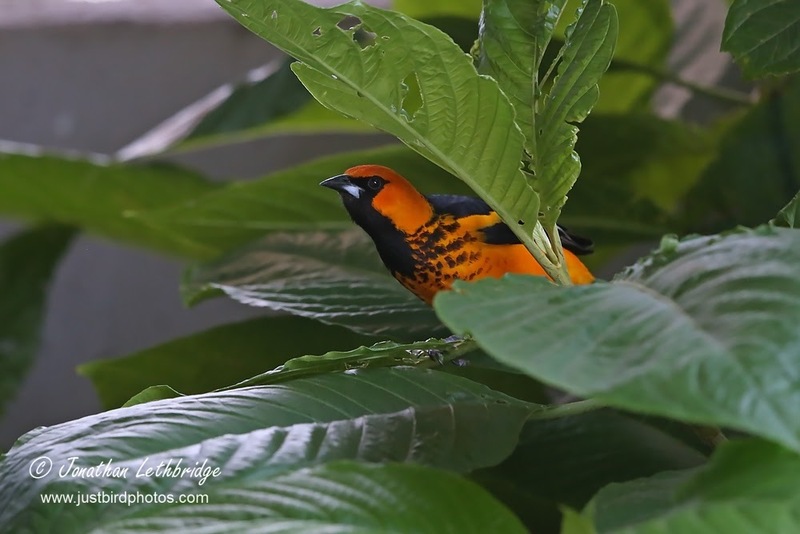 Futher away from the feeders we get our first of many Common Chlorospingus (aka Common Bush Tanager), and Red-faced Spinetail. A key bird here is White-eared Ground Sparrow and we pick that up too. We discovered here that Leo has a laser pointer that will play a key part in getting us on the birds before they disappear - rather than attempt to describe where in the huge tangle of vegetation the bird is he simply shines the green pointer somewhere close to it, or we follow it up an obvious branch and then only when the light is approaching the bird does he say left of the light, above the light two feet etc. Genius, and I can truthfully say that throughout the trip it made a massive difference. As payment-in-kind for the upkeep of the garden and short trails we bought a delicious strawberry milkshake from the café opposite and then made an abortive attempt at Resplendant Quetzal at a nearby fruiting tree. Whilst this was not the key place for the Quetzal I think a lot of guides try and get it early to relieve a bit of the pressure, so worth a try. No dice but we did get our only Prong-billed Barbet of the trip, a bird which I remembered from the field guide as it looks a but like a Hawfinch. Some White-crowned Parrots were here too, and I spilled half the milkshake in the footwell of the car which impressed Leo no end. The next stop is a familiar one on many Costa Rica agendas, the La Paz Waterfall Gardens (Catarata de la Paz, on route 126). This is mostly a zoo as far as I could tell, but it has many fabulous trails and loads of Hummingbird feeders. The entrance fee is steep but it includes lunch and was in any event included in the trip cost. 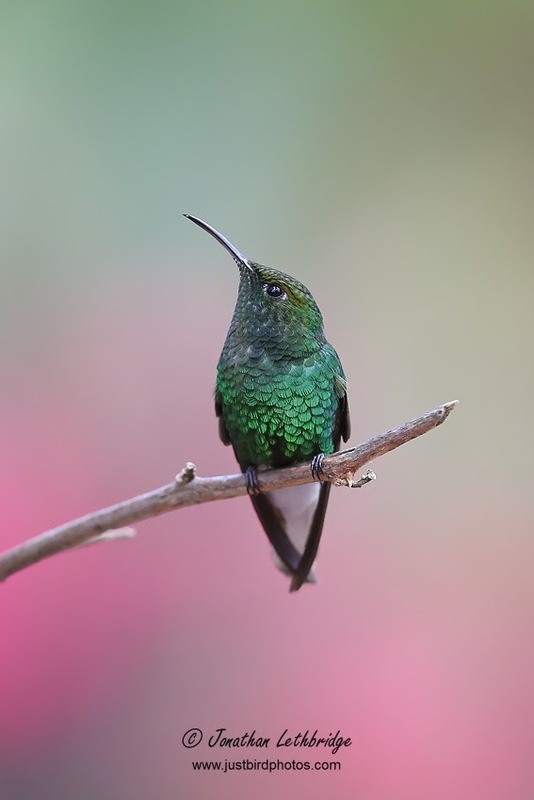 Violet Sabrewing, one of the larger hummingbirds, was probably one of the first birds we saw, but the feeders lower down had plenty of other Hummers including Coppery-winged Emerald, Lesser Violetear, Green Thorntail, Green-crowned Brilliant and Green Hermit. I could have stayed all day taking photos, trying to get images of birds away from the many sugar feeders and instead on natural perches or in flight (unbelievably difficult!) - indeed this was the case at many places we visited - but birding took precedence and we took the trail that leads down to the main waterfall vista. 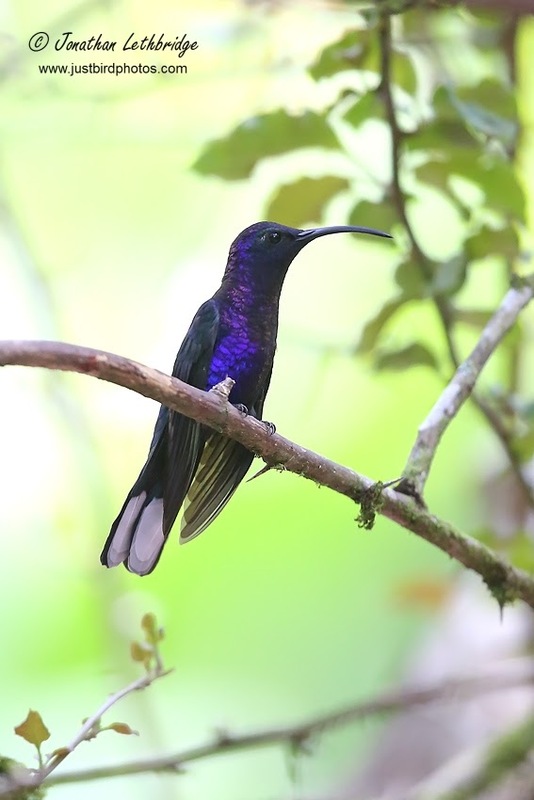 Purple-throated Mountain Gem on sub-optimal perch. There were birds everywhere, you simply did not know where to look. (Hint, at the green light!). 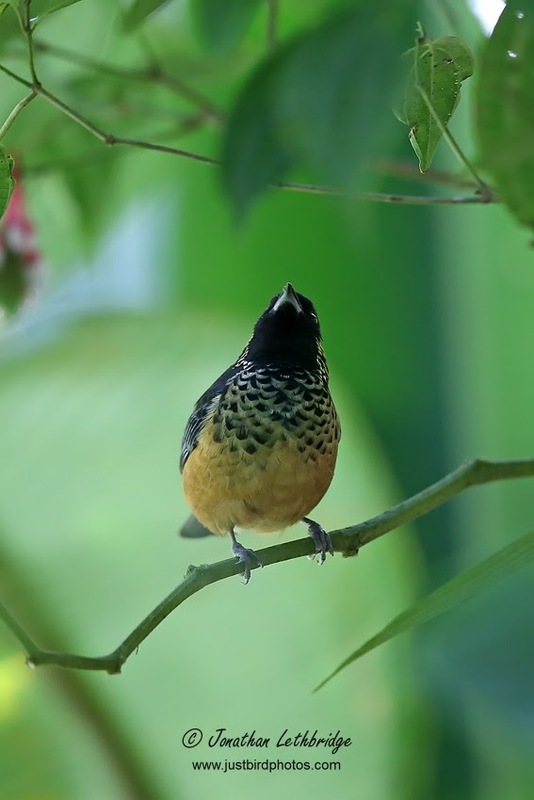 Black Guan in a tree, Ochraceous Wren climbing a banana tree, Yellow-thighed Finch on a log, Chestnut-capped Brushfinch grubbing around in the leaf litter, stripey-headed Costa Rica Warblers bouncing through the mid-levels and Wedge-billed Woodcreepers hopping up vertical trunks. I've rarely experienced birding like it, the action was non-stop. Some time was spent hoping that an Ochre-breasted Antpitta that Leo had heard call twice might respond to his speaker, but sadly it did not. By the way, in my experience tape seems to be an integral part of guided birding in South America and the Caribbean. 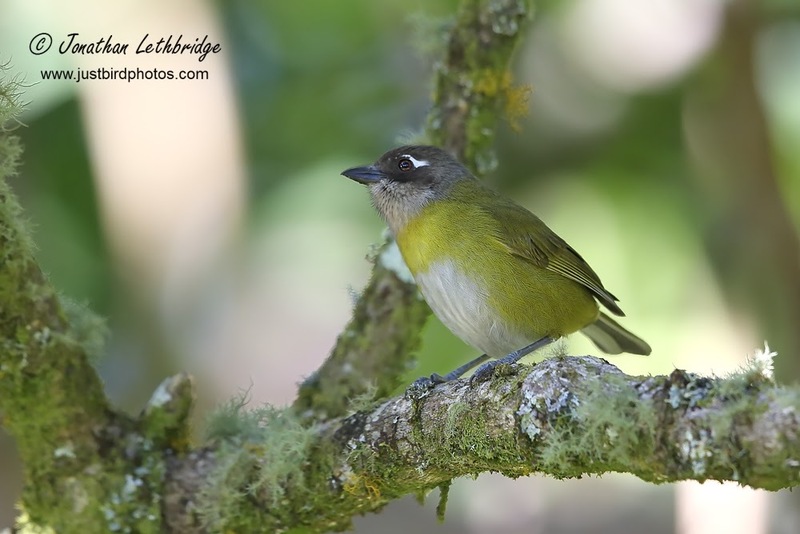 As well as Costa Rica, guides I've used in Argentina, Tobago and St Lucia have all used mp3 extensively to bring birds in. In the UK a certain segment of birders loathe it but abroad it seems to be very common and, like the laser pen, it made a huge difference in getting good views, indeed any views, of quite a few species. 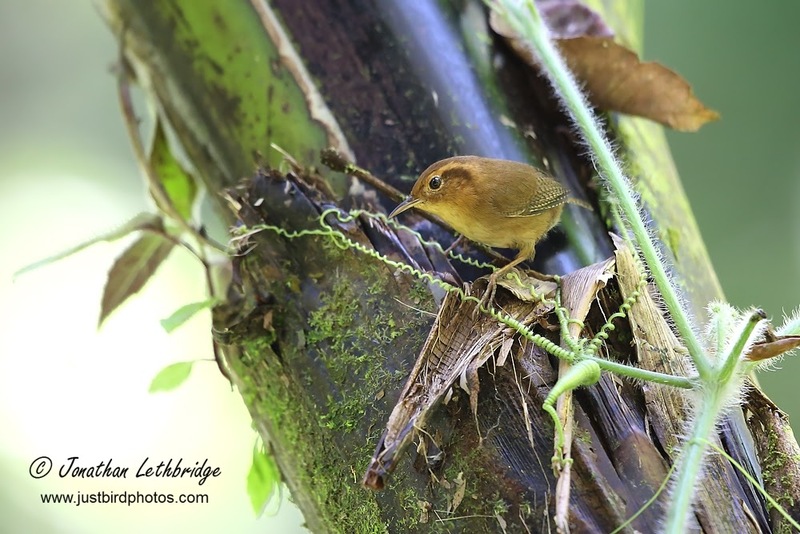 We gradually picked our way down the ravine to the waterfalls lifering constantly, tick after tick after tick and many of the birds seen exceptionally well albeit not to photograph. Tufted Flycatchers sallied high above the water whilst a Green Lancebill hunted insects closer to the surface. 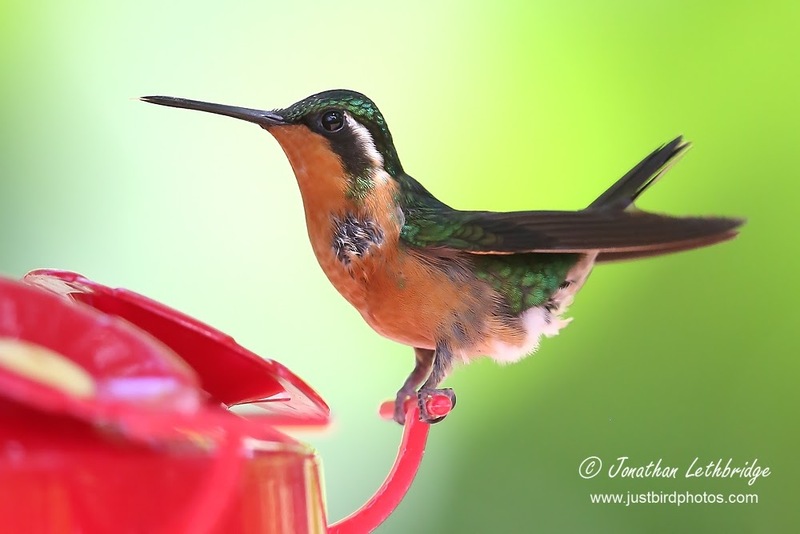 A shuttle took us the short distance back up main road to the entrance, and then we returned to the restaurant and hummingbird feeders for a break. Sooty-faced Finch was pottering around the buffet, another bird we were not likely to see anywhere else, and I managed to sneak another few minutes with various hummingbirds. It had been an exhilarating morning and this was only our second stop!